Santiago was really cool. It was quite an overwhelming experience there. We had arrived after a 12-hour plane ride from Texas and had less than an hour to get to our apartments, clean up and prepare for the several hours of touring the city. It was quite a rush, and without much sleep, I just wanted to go to bed. But we were in SANTIAGO, CHILE, no time for sleep. 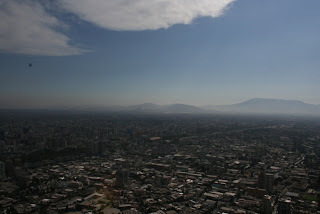 The weather in Santiago was very humid and smoggy. I didn’t bring the appropriate summer clothes for this weather only because its important to blend in, not stand out, especially as an American… Santiago is very polluted, mostly because 1/3 of the population lives in the city. But I was surprised at how clean the streets were- more clean than some cities in the United States that I have been to. The entire weekend in Santiago was overwhelming. In between tours, we had orientation meetings to prepare for living in Chile, as well as going to school. It was a ton of information to absorb but it was definitely really nice to have as I imagine some international students do not have such a great organization as we do to prepare them like this. We were all getting to know each other throughout the weekend as well. There are about 50 kids here in Viña del Mar and Valparaiso studying abroad with ISA. I was amazed at how many American students chose Chile… it was/has been fun getting to know everyone. Immediately I connected with my roommate (only for Santiago) Nicole, and we befriended a few other girls who we hung out with the whole weekend. Sunday evening, February 29, we boarded a bus to meet our host families… I was so nervous, yet so excited.